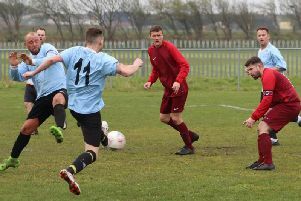 Blackpool Wren Rovers got back to winning ways and extended their lead at the summit of the West Lancashire Football League Premier Division with a thumping 5-0 victory. On the back of a surprise 3-2 defeat to relegation strugglers Vickerstown, Wren Rovers responded in perfect style by seeing off fifth-placed Slyne with Hest. Carl Eastwood opened the scoring after 20 minutes before Bradley Gill doubled their lead after the half-hour mark. Michael Clarke added a third after the half-time interval before Danny Morris scored two minutes later. Eastwood completed his brace to wrap up the win in fine style with their fifth four minutes from time. The comfortable victory sees Wren Rovers extend their gap at the top to 14 points after second placed Garstang were held 1-1 in their game at Southport Hesketh. Jonny Hothersall gave them the lead after five minutes but Luke Smith equalised for the hosts. Despite the 14-point gap, Garstang still have six games in hand. Thornton Cleveley’s trip to Haslingden St Marys was postponed. In Division One, Lytham Town came from two goals down to secure a late 3-3 draw at Eagley. The hosts raced 2-0 ahead with goals from Matthew Johnson and Danny Holroyd, only for Ross Ainsworth to get one back for Lytham. Matthew Leatham restored Eagley’s two-goal lead with 25 minutes to play but Lytham cut the deficit once again through Nathan Cook. Ainsworth’s second of the afternoon, five minutes from time, completed Lytham’s comeback. Wyre Villa climbed up to 12th with a 2-1 win in their game against Fulwood Amateurs Reserves. Dale Pattern and Dan Smith grabbed the goals for Wyre while Jonathan Wilding added his name to the scoresheet for Fulwood. Poulton’s trip to Hawcoat Park was also called off. The quarter-finals of the Berrys Beds Divisional Cup for the Blackpool and Fylde Sunday Football Alliance teams were staged at the weekend. In the Premier Cup, the Saddle and Bloomfield Brewhouse played out an entertaining game. The teams were level at 2-2 after 90 minutes before the Saddle stepped up a few gears and ran out 7-2 winners with Danny Morris helping himself to a hat-trick and two each for Brad Gill and Jarred Bain. Chris Glynn and Craig Harding scored for Bloomfield. Lancashire Cup semi-finalists Blackhurst budd and Broomheads Estate Agency went head to head as Dax Hoogerwerf’s penalty put Broomheads ahead but a Josh Miller double and Brett Dawson’s goal gave the hosts a 3-1 win. League leaders Additions continued their stunning season with a 5-2 win over a depleted Shovels team with goals from Nathan Hine(2), Anthony Smith, Dean Richards and Scott Bradford, while Aaron Fleming and Daniel McGovern replied. In the Division One Cup, E and P Publications had a comfortable win at BES Utilities with SamDyer scoring four goals in his team’s 6-1 win. Also scoring were Robert Pye and Ellis Tortelly with Daniel Stoney replying. Anchorsholme and Station Lytham needed penalties to separate them after a 2-2 draw. Ben McKay put Station ahead before a Danny Horner free kick levelled it. Both players scored in extra time to set up penalties with Station winning 4-3. Josh Kirkham, Lewis Masters and Richard Tomlinson gave Wesham a 3-1 win against AFC Jewsons Blackpool for whom Jamie Dewhurst scored. In the Division Two Cup, Simon Annetts scored the only goal as McNaughtons beat Highlands 1-0. Billy Dollin (4), Jonathan Gough, Steven Rankine and Sam Firman gave Westview a 7-3 win against Kirkham Town, for whom Rian MacDonald (2) and Jason Lee scored. Marshall Court beat Wrea Green by the same score as Stuart Hammond (3), Chris Flynn (2), Jake Whittaker and Michael Smith scored with Shaun Worden (2) and Jordan Ford replying. In the Bathroom Solutions Premier Division, two goals each forLuke Robinson, Scott Grimes and Jordan Kilgallon gave Appletree Finance a 6-2 win against Kingsfield with Tony Whittle replying. Exceptional Kitchens went third as Chris Moreton and Adam Zyda gave them a 2-1 win at FC Rangers, whose goal came from Adam Bush. Division one’s only goal saw David Morris and Craig Worrall give Highfield Social a 2-1 win over the Layton Pub, Karl McLeod replying. In division two, Josh Errington and Jamie Thornton had Layton Seniors 2-0 up against King Edward before Jack Williams (2) and Ryan Willetts clinched a 3-2 win. Harry Taylor, Mitchell Smith, Rob Heritage and Taylor Clews gave Boars Head a 4-0 win over the George. Chorley had managed to complete only two previous Mid-Lancashire League fixtures all season on their Astley Park pitch, so needless to say this was not a pretty game in the mud and did not suit Anchorsholme’s style. However, a depleted Anchors side adapted to the conditions and led 1-0 at half-time thanks to Corey Harrison’s 33rd goal of the season. Chorley battled hard and defended well for large periods of the second half as Anchors threw everything they had at their defence, and the floodgates finally opened with four goals in the final 20 minutes from Luke Robinson, Stuart Harris and a Daniel Rapley brace. Anchors are still two points behind leaders Freckleton in the first division but have a game in hand, so victory in their remaining four games will secure the title.